XPB Locker Supply will Help Clients Meet all Accessibility Requirements. Accessibility requirements for bathroom stalls vary from state to state. ADA regulations are federally mandated and as such represent a universal standard for restroom architectural design. However, these standards must be seen as merely baseline when we take into account that many areas of the United States have state and local codes that specify additional requirements for handicapped access. To accommodate this level of regulation, XPB Locker Supply maintains a full inventory of toilet partition hardware and commercial restroom accessories that will enable contractors to build commercial restrooms that are fully up to code in their particular region. XPB Locker Supply will Assist in Developing Your Layout Configuration. When clients face challenging scenarios where a high level of accessibility must be provided in a very limited space, XPB Locker Supply offers detailed architectural design assistance in helping facility managers, architects, and contractors come up with the very best layout configurations for the space at hand. ADA and other handicapped accessible bathroom stalls can be developed in freestanding layouts, corner alcove layouts, alcoves, between wall layouts, and open-ended layouts, just to name a few. XPB Locker Supply will also customize partitions, panels, and doors for specific restroom environments. One of the more popular customization options we offer is the European no-site configuration. 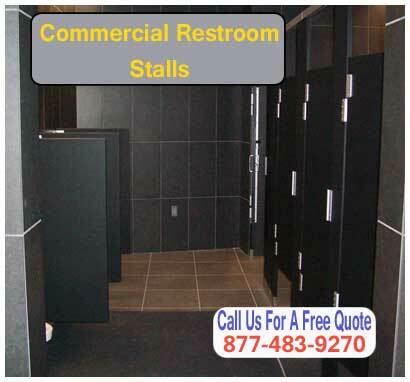 This layout is ideal for public restrooms where users have a high expectation of privacy. The no-site layout eliminates the gap between the door and the pilaster, essentially creating a solid surface when the door is closed. This not only has proven very effective in restroom partition design, but also in shower rooms where exceptionally large partitions are used to create shower stalls. XPB Locker will recommend the best bathroom stall materials and mounting style for your particular architectural design. Factors such as the distance between the floor and the ceiling, the number of users coming in and out of the restroom during the day, and the likelihood of deliberate vandalism all play a role in determining which partition materials should be used and how partitions, pilasters, and doors should be mounted. In high traffic environments, or in places where the risk of vandalism is great, stronger materials are recommended in order to reduce the likelihood of replacement costs. When budgets are limited, mid-ranged materials with reinforced mounting styles may be substituted to strike a balance between front-end costs and long-term investment value.